Introducing EBC’s highly improved Ultimax2™ OE quality replacement ECO friendly brake pads. The original formula was good, but this one is far superior! 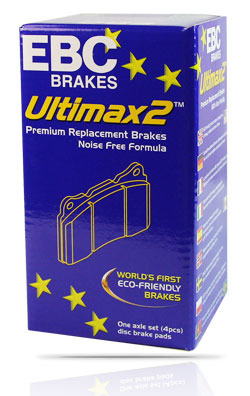 Ultimax2™ OE quality replacement brake pads are a direct replacement of the original Ultimax™ brake pad. For a high quality OEM replacement brake pad, the Ultimax2™ brake pad is the most popular choice. The Ultimax2™ is manufactured at the UK Bristol EBC Brakes manufacturing plant and is a precision-engineered brake pad compound that has longevity of use, creates minimal dust and is the perfect selection for the urban street driver. The Ultimax2™ brake pad provides a good quality replacement brake pad at a very reasonable price. Now 100% friendly to the environment including ZERO sulphides. Instant braking in after installation with EBC red Brake-In™ coating. Shims are not needed for noise reduction. R90 approved brake pad making it good for urban street driving. Suitable for use in all mixed climates – dry, hot, cold, wet environments etc. For a completely NON METALLIC brake pad containing ZERO steel fibre the Ultimax2™ OE quality replacement brake pad are a top choice. The new brake pad formula is less harsh on brake rotors made from cast iron. Along with this the pad is extremely clean and environmentally friendly. The USA brake ratings system has graded the Ultimax2™ as Code ‘N’, giving this brake product the FIRST place award for it’s 100% ECO friendly status. It has also gained the highly desirable GG friction rating, a rarity within the industry of automotive brake manufacture. In conclusion, if you are looking for an affordable, eco friendly brake pad that is long lasting, with NO toxic waste then EBC's Ultimax2™ is streets ahead of it's time! It offers the everyday driver powerful braking from initial brake application in any weather condition or climate, when used virtually anywhere in the world. This new and improved brake pad also benefits from zero brake noise.